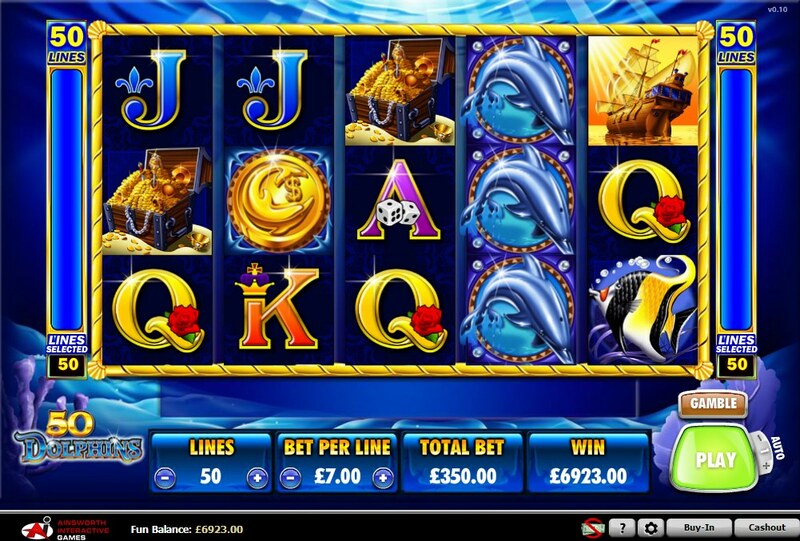 50 Dolphins is a slot where the name of the slot pretty much encompasses everything this 5 reel slot is about. It has 50 pay-lines and the theme revolves around dolphins. Australian-based slot developer Ainsworth have released what initially might seem like a fairly shallow slot title but there is more than meets the eye in this slot with plenty of opportunity to win big and have a fun time along the way. 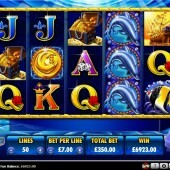 The Dolphin Wild symbol is the main symbol you want to keep a look out for in this slot. It substitutes for all other symbols, except for the Scatter, to complete winning combinations. The Scatter symbol is represented by the Dolphin Medallion symbol. This is the key to triggering the free spins bonus round where the real money can be won. You must hit three or more of these Scatters across the reels during regular gameplay. If you manage to do this then you will be awarded with 10 free spins immediately. All wins achieved during the free spins are multiplied by the bet-line value. You can win an additional 5 free spins if you hit three or more Scatters during the free spins. During the free spins the Wild symbols can appear as Stacked Wilds on reels 2, 3 and 4 giving you an increased chance of winning bigger prizes. There are also a range of other symbols you should keep an eye out for including the ship, treasure chest, pearls, tropical fish and shells. If you hit five of one of these symbols across the reels then you could be looking at a cheeky payout of up to 1,000 coins. 50 Dolphins will not revolutionize online slot gaming but it is a superb transfer from land-based casino play to online casino gaming. The Stacked Wilds that crop up in the free spins makes the free spins bonus round well worth waiting for and the 10 free spins will feel like a lot more with the potential wins that can be achieved. Players that have enjoyed other Ainsworth titles such as the fiery Roaming Reels and the African savannah-set Safari Spirit will feel this slot is a step up in both excitement and enjoyment.